It’s Not Too Late to Register for Winter Music Lessons! Call 203-748-1444 for more info. Act NOW for best schedule availability! 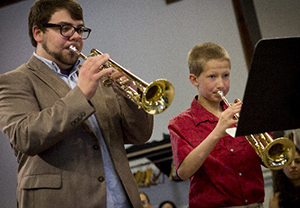 Our brass lessons include private trumpet lessons, french horn lessons, trombone lessons and tuba lessons. Students for these instruments usually are ages 9 or older as they need to have developed sufficient lung capacity. Our brass teachers have university or college degrees in music and are active performers in a variety of settings. We can help students enhance their instrumental skills for greater success in their school band program, or to help develop advanced skills as a soloist. Contact Us Now for More Information. Serving towns in northern Fairfield County and Litchfield County, Connecticut – including: Danbury, Bethel, Brookfield, New Fairfield, Ridgefield, Newtown, Redding, Roxbury, Bridgewater, New Milford and Sherman. Serving towns in Putnam County, Duchess County, and northern Westchester County, New York – including: Brewster, North Salem, South Salem, Carmel, Cross River, Bedford, Lewisboro, Purdy’s, Golden’s Bridge, Katonah, Mahopac, Lake Carmel, Lake Mahopac, Southeast, Salem, Croton Falls, Patterson, Pawling and Waccabuc.